New Delhi, February 1: Warning Pakistan to stop interfering in internal matters and disturbing the unity of the country, India has strongly protested on Pakistan Foreign Minister’s telephonic conversation with Hurriyat leader. Implying on the same India said it has “very strongly” taken up with the UK the issue of a conference on Kashmir being allowed to be hosted in London which is scheduled to be addressed by Pakistan Foreign Minister Shah Mahmood Qureshi. 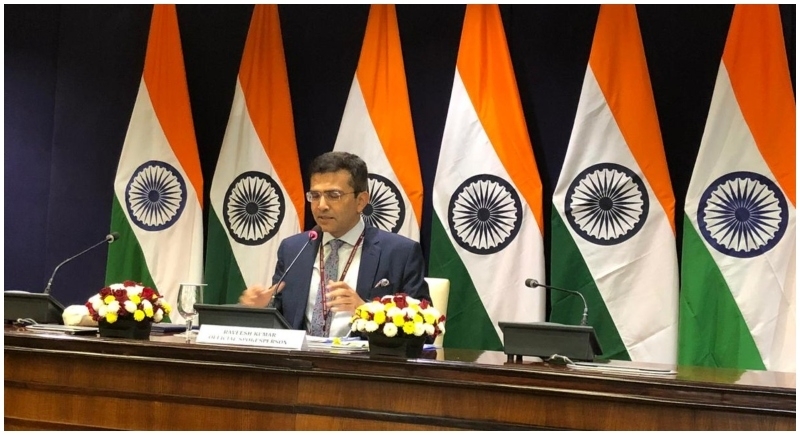 External Affairs Ministry Spokesperson Raveesh Kumar said India was expecting the British government to address its concerns on the issue, adding the conference is “very clearly” intended to undermine unity, sovereignty and territorial integrity of India. Speaking further Raveesh Kumar added that the event reflected Pakistan’s “duplicity” in its relations with India. “There is no doubt that it (the conference) exposes Pakistan’s duplicity when they talk about peace (with India) on one hand and at the same time working with forces which are fomenting anti-India sentiments,” Kumar said. India strongly protested against Pakistan Foreign Minister calling Hurriyat leader Umar Farooq and inviting him in the conference. Implying a stern warning, India asked Pakistan to not interfere in internal matters of India and try on resolving issues within Pakistan.